Are you a commuter who finds yourself with downtime you could use to work on your SmartPhone or PocketPC? It starts with a simple download of the Mobile Translator software to your cell phone, Pocket PC, Handheld, PDA or mobile device... that's all you need to start translating on the go. The Mobile Translator will always be on hand whenever you need a quick word look-up during a conversation, a language helper in a restaurant or on holiday, translation of an important client email or document, verb conjugation to prepare for a test, and a million other language tasks. 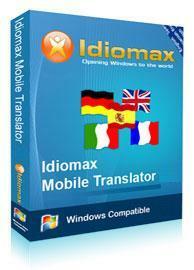 IdiomaX Mobile Translator works with SmartPhones, PDAs and PocketPCs. Translate from applications like: Outlook email, Internet, Pocket Word documents, etc. If your work requires language translation or you simply love languages, the Mobile Translator is the most important and enjoyable software you'll ever use. On the job, at school, or just for fun.